There he was, today, once again making the football field he stood on the the center of the world’s attention. Joe Namath wore his old trademark fur coat for the toin coss that started the 2014 Superbowl game. In case twenty-first century eyes didn’t recognize the seventy-year old man who tossed the coin kicking off today’s Superbowl game, however, he offered some immediate visual cues. Once again, he was wearing a big fur coat. And once again, he was making good with the ladies. The logo for the first Superbowl, 1969. It was, of course, Joe Namath, the legendary former New York Jets quarterback who led that team to its stunning upset victory of the the 1969 Superbowl, the first such-designated game. And while nearly half a century has passed since that historic Superbowl game, he’s still a man known by the fur coat on his back and the women on his arms. 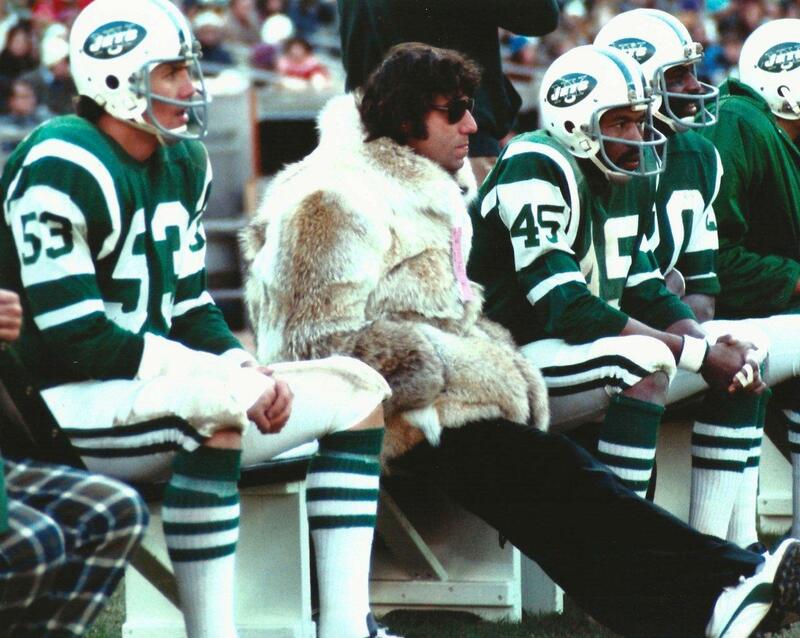 Namath in yet another one of his famous fur coats, along with the white sneakers he insisted on wearing. If anyone deserves credit for so popularizing an annual football game that heats up a nation in the dead of winter it’s this smiling athlete who, despite ending his career in sunny California, couldn’t help being anyone but Broadway Joe. All of his grandparents immigrated from Hungary through Ellis Island. He was born on Memorial Day, two years before World War II ended. He played football, basketball and baseball in high school at Beaver Falls, Pennsylvania. But one factor about Joe Namath marks him as quintessentially American. Namath in his white shoes and one of his numerous fur coats. Without betraying his own lusty sense of identity as a twenty-five year old white male, Namath rose to become a national celebrity at the dawning of the Age of Aquarius. Without sacrifice for his athletic prowess and the discipline to continually improve it, he unabashedly made it clear he was loving all the hard work. With his long hair, white fur coats, and wearing women’s pantyhose in a national television commercial, the burly football player was symbolic of the national debate just then beginning about changing gender roles. It was in being true to his own very unique self, however, that Joe Namath prompted an unprecedented level of national interest in professional football and unwittingly prompted the exciting velocity of a championship game between two very different leagues which led to it becoming that unofficial national holiday known as Super Bowl Sunday. As one fact bears witness, this secular holiday has become just as strong a draw for gathering together families and friends that many churches often cancel all but the early morning services on Super Bowl Sunday, the pews deserted for seats in front of Jumbotrons. Originally, he dreamed of becoming a baseball player like his idol Roberto Clemente and playing with his team, the Pirates in Pittsburgh, less than an hour from Namath’s home. His working-class mother, however, knew he’d have a good chance of landing further from their Lower End neighborhood if he had a college education and that he was so good at football he’d get a full scholarship. She was right. Namath at Alabama, Bryant behind him. Being in Alabama through 1964 also gave Joe the first opportunity to stick out like a sore thumb – and with great pride. He was highly offended by segregation and never failed to fire up his outrage against white racists, even if they were his own teammates. Otherwise, he generated an enervating humor, balancing what could sound like arrogance except for the fact that he always delivered the lines not with humorless egotism but a smiling wink and a laughing grin. Joe Namath about to pass. The noise he was generating on the football field, however, was even louder. His toss was explosive, his agility compared to ballet. At the start of his final year of college, in the fall of 1965, Namath attracted the interest of scouts representing the two distinct football leagues in existence at the time. The National Football League came to Joe Namath’s college dormitory room to court him. Founded in 1920, the NFL was the establishment, conservative in its rulings intended to raise the standards of professional football among the teams across the country which gained NFL membership. Namath the University of Alabama student on the verge of becoming a New York legend. When the NFL reps began negotiating with Namath, who sat there with no lawyer or agent in his dorm room, they acted with stunned horror when he focused his steely blue eyes on them and coolly said he’d sign for $200,000 – and a car. Such demands from a college kid were unheard of in the NFL. It was outrageous. He was pushing the limits of decency. “They fell down on the bed, screamed, leaned back against the wall, like they were in agony. They went nuts,” Namath recalled of their reaction when he told them the exact make and model of the automobile he wanted. Even if he hadn’t asked for the car, let alone specify what kind, it seems Namath could only have signed with the American Football League. Jets coach Weeb Ewbank, Namath and Mr. Show Biz himself. Instead of huddling the University of Alabama senior in his dingy dorm room like the NFL did, Joe Namath was flown first-class in the middle of November out to the balmy West Coast by the AFL. At the airport, he was met like a movie star with a waiting limousine which them swept him to the Beverly Hills Hotel. In a posh suite upstairs at the hotel, the AFL’s New York Jets owner, a man known as “Mr. Show Biz,” began talking real turkey to Namath, joined by the team coach Weeb Ewbank. Joe Namath being fitted for another fur coat. By the time David Abraham “Sonny” Werblin escorted Namath down to a Beverly Hills Hotel suite for a press conference, their brilliant marriage of art and commerce, specifically the art of sports, had been consummated. Namath had not merely signed with the Jets, he did so for the apoplectic amount of $427,000. He could buy many Lincoln Continentals with that. He would certainly not just buy a lot of fur coats with that money, he would also unabashedly wear them. Nor did he mind spending a good amount of it with ladies out on the town. Which was a fact that began drawing unprecedented numbers of new football fans who just so happened to be young, unmarried women. Namath in perhaps the most famous of his coats, a white fur-collared one that reached to the floor. Who just so happened to be a prime demographic for television advertisers. Joe Namath’s mammoth paycheck and the fact that the AFL had openly outbid the old NFL would soon result directly in the game that is now known as the Superbowl. Beyond the practical financial motives that would lead to the creation of the Superbowl, however, Joe Namath would inspire first his team and then the watching nation by infusing the game of football with a genuine passion that no money could buy or no publicist could concoct. It was borne not just of Namath’s determination to right a perceived wrong against a degraded underdog, but a personal gratitude simply for what everyone watching also hoped for themselves – the chance to make a living doing what he loved to do. Namath at the 2014 Superbowl, still making good with the ladies. Ole’ Joe still has it! That smile and beautiful teeth is worth seeing! The happy even gleeful attitude he seemed to have towards practically everything really shone through, from the inside out. Thanks for writing Judi. I seem to remember that a reported once asked him how many women he had been with. His response was something like “I don’t know. After 100 you kind of lose track.” Great answer. Ohho…never heard that one. Have to at least hand it to the guy for always being honest. There was no deceit, no repressed anger or anything of that sort in him. Seems to me fairly healthy, especially after experiencing such a rush of global fame. This is when I got interested in the game. I am remembering a time when my sister, Mom and me were in the city. We had to eat at Broadway’s Joe’s. I kept that cup for the longest time. Wow – so great you’re an authentic example of just what the article talked about, how Namath drew women into becoming interested in football. Never went to that restaurant myself – is it up and running I wonder? I wasn’t a woman quite yet (at that time) but, yes, he sure piqued my interest. About the restaurant….I am going to have to ask my sister where it was in the city. Will add, not happy about the fur coats now. Thanks for this writing, Carl…. Glad you enjoyed the article. If I gab some time, I do have a second part to this article which does focus more on how the NFL certainly saw Namath as advantageous to expanding television viewership of football to the “new” demographic of women. Thanks for writing Beth. One of my sister’s high school pals left home at 18 to become a Namath groupie, following him on the road for years and shocking our whole little town out of its wits in the process. He was like an athletic version of The Beatles. I wasn’t interested in either Namath or football, but I did recognize him as a great example of something which always has intrigued me: a very human and American phenomenon, totally unique and endowed with the ability to set his mark on his times–and even, to some extent, the future. I think you observations of Namath’s impact is pretty astute. If I manage to get out the second part of the article (it was too much material for just one article), I think readers might also realize just how intelligent, savvy yet utterly genuine and natural he was – in addition to his passion for his work and enthusiasm and embrace of all people who approached him. He was always so grateful and appreciative of it, which I think only further fueled a supportive interest in him as a person, even apart from his stats as a Hall of Famer. Thanks for writing.